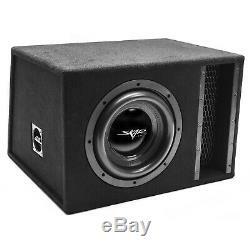 Skar Audio Single 10 2,000 Watt EVL Series Subwoofer Package - Includes 10-Inch Dual 2 Ohm Subwoofer in Ported Box. Skar Audio created this premium loaded enclosure package to make it easier than ever to add low-frequency, head-turning bass to your vehicle. This package is equipped with one, 10-inch, dual 2-ohm, Skar Audio EVL Series subwoofer, which is pre-loaded and wired up inside of a premium single 10-inch wedge-style ported enclosure. The Skar Audio EVL series of subwoofers redefines the definition of low-end sound reproduction. The engineering behind developing a driver that is able to accurately handle the frequency range of these notes with authority is what makes this woofer so unique. From the bottom to the top, this subwoofer utilizes an array of design features and materials that distinctively put it in a class of its own. This enclosure is covered in industrial-grade black carpet and features the debut of our advanced port design, which promotes generous air movement, while reducing distortion. This package was put together by our installation experts to ensure compatibility and allow for an easy installation. We take the guess work out of pairing the components of your system up, and make it easy to get the bass you've always wanted in your ride. Compatible with The Following Vehicles. Universal Fit - Check Enclosure Dimensions to Ensure a Proper Fit. 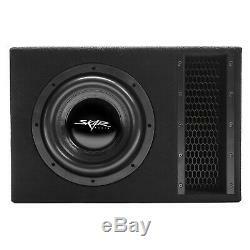 The dual 2 ohm subwoofer included in this package is pre-wired and loaded into the subwoofer enclosure at a 1-ohm final load to ensure an easy and hassle free installation. Skar Audio EVL-10 D2 Subwoofer Specifications. Dual 2 Ohm Voice Coil Configuration. Peak Power: 2,000 Watts. RMS Power: 1,000 Watts. Competition Grade Pressed Paper Cone. Stitched High Roll Foam Surround. Advanced Air Flow Cooling System. 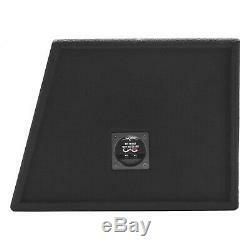 4 Layer Black Aluminum CCAW Voice Coil. Single 10 Ported Enclosure Specifications. 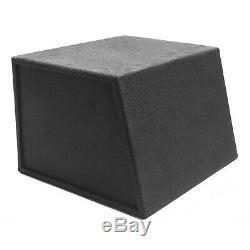 Single 10-Inch Ported Subwoofer Enclosure. 1-Hole 10 Vented Carpeted box. Air Space: 1.65 Cubic Feet. Second Depth Measurement Includes the Subwoofer. Port Dimensions: 27" L x 2.5" W x 12.5 H. We believe that our customers define who we are as a company, which is why we believe so strongly in putting them first. Founded in early 2012 by the current CEO, Kevin Schlenker, Skar Audio has grown from just a hobby, into a business that now employs a full time staff of nearly 20 people. We have a highly dedicated team that is constantly raising the bar and executing with precision, all while keeping our customers at our core. Since day one, our focus as a company has been to design and engineer products that are constantly raising the bar and defining new limits. We emphasize on designing competition grade products priced for the normal consumer, but without sacrificing build quality. It is important to us that if you see our products being used in the lanes, that you have access to obtaining those products. Skar Audio is located in the heart of the manufacturing district in Tampa, Florida. Our headquarters is home to the proud staff of nearly 20 people, who are audiophiles themselves and love to serve our customers everyday. With our facility being over 17,000 sq ft, and featuring show rooms, testing rooms, a new product development center, as well our warehouse and offices; we are happy to offer tours to local or visiting enthusiasts and customers to show them what we are all about. We take the hands on approach in delivering value to everyone we deal with, and maintain an open door policy at the office. The item "NEW SKAR AUDIO EVL-1X10D2 SINGLE 10 2000 WATT VENTED LOADED SUB BOX ENCLOSURE" is in sale since Tuesday, April 2, 2019. This item is in the category "Consumer Electronics\Vehicle Electronics & GPS\Car Audio\Car Subwoofers". 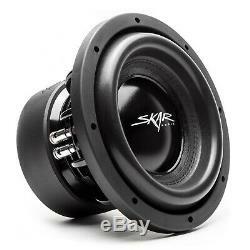 The seller is "skar-audio" and is located in Tampa, Florida. This item can be shipped to United States, Canada, United Kingdom, Denmark, Romania, Slovakia, Bulgaria, Czech republic, Finland, Hungary, Latvia, Lithuania, Malta, Estonia, Australia, Greece, Portugal, Cyprus, Slovenia, Japan, China, Sweden, South Korea, Indonesia, Taiwan, South africa, Thailand, Belgium, France, Hong Kong, Ireland, Netherlands, Poland, Spain, Italy, Germany, Austria, Bahamas, Israel, Mexico, New Zealand, Philippines, Singapore, Switzerland, Norway, Saudi arabia, Ukraine, United arab emirates, Qatar, Kuwait, Bahrain, Croatia, Malaysia, Brazil, Chile, Colombia, Costa rica, Panama, Trinidad and tobago, Guatemala, Honduras, Jamaica, Antigua and barbuda, Aruba, Belize, Dominica, Grenada, Saint kitts and nevis, Turks and caicos islands, Barbados, Bangladesh, Bermuda, Brunei darussalam, Bolivia, Ecuador, Egypt, French guiana, Guadeloupe, Iceland, Cambodia, Cayman islands, Sri lanka, Martinique, Maldives, Nicaragua, Oman, Peru, Pakistan, Paraguay, Reunion, Viet nam, Uruguay.